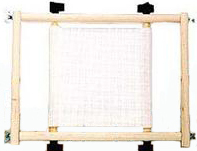 Scroll frame components are not interchangeable between manufacturers. Those that use bolts on the ends do not use the same sizes bolt. If you already have a brand it's best to stick with that brand. Or contact us to check on compatibility. We are now ordering RolaFrame scroll frames. The sizes below are what we plan to stock but if you need another size, please contact as there is a huge range of options, especially for the rollers. 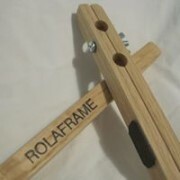 RolaFrame uses tiny nails to hold your work in place and while that sounds scary, it actually works quite well. The rollers are held to the bars with bolts & wing nuts, so this system does not require knobs, although you use the K's Creations Mini Tri-knobs (see below) in place of the wing nuts. There is a wood wing nut tool, which helps you tighten the wing nuts if you find it hard to do. As these are made by just guy in TN, we're having a hard time keeping them in stock. We're trying to build up our inventory but as he's been very busy by the time we get an order most of it is sold out. Your patience is appreciated while we work out how to get a handle on keeping them in inventory. The sizes below are just those we've decided to order for now. If you need another size, please contact us at the shop and we can most likely add it to our next order with RolaFrame. We carry the individual components to create the size scroll frame you need, or to add to one you already own. 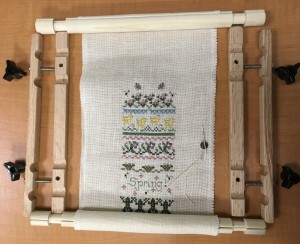 The rods have webbing attached to them and you either sew your project to the webbing or use the No Baste System to attach it to the webbing. In October 2017 we were informed that Embroidery Central had purchased American Dream Products (which closed in August 2017). We expect that they will be producing all of the EZ Stitch products at some point, although as of August 2018 we haven't seen the new rods/bars yet. We are able to get the NoBaste system hook & loop tape again and a few of the bars, but none of the rods. 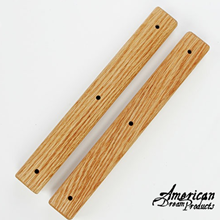 We now are ordering Yarn Tree Rods, which are interchangeable with the EZ Stitch Rods. 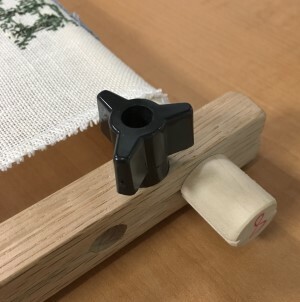 K's Creations has a mini-tri knob that will work with the EZ Stitch rods. 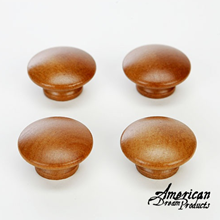 If you find that you strip the wood knobs, this will prevent that from happening. The back is sticky so you can peal the covering off and stick it to either your scroll rods (webbing) or your project. While similar to Velcro brand hook & loop tape, this has a thinner profile and is a narrower as well - well suited to needlework. You do not need to remove it from the webbing unless it is worn out. It should be removed from your stitching project (cut off the area it is stuck to) before you have it finished into it's final product. 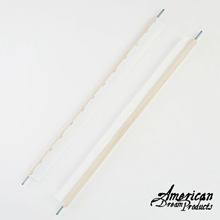 In addition to K's Creations stands, we carry their Belt Frames (horizontal scroll frame) as well as several sizes of their Perfect Tension Side Bars. We can special order any of their scroll frame components as well. If you are looking for a different size Belt Frame we can see about having one made for you. You can hold it by the side bars just like a regular scroll frame. 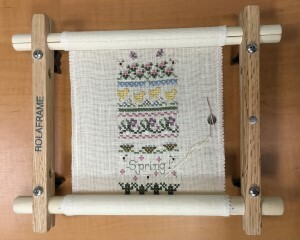 Only this frame has the rods at the side so it scrolls sideways. 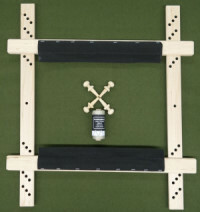 Use Standard or Large base if you wish to mount it into a base as shown below. Base not included in the frame price. For projects that are very wide, where a traditional scroll fame won't work. Perfect Tension II bars allow for more tautness in your scroll frames. We stock the unstained bars. The older Perfect Tension bars with the upper black plastic section are no longer manufactured. Perfect Tension II bars are all wood except for the bolts and screws. the extra tightening power of the Perfect Tension side bars. if used with wing nuts. 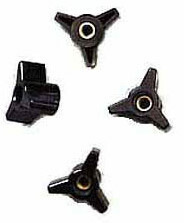 You can order a 4 pack of wing nuts below (enough for one set of rods). K's Creations rods will NOT work with EZ Stitch bars. The regular size only fit K's Creations rods. New from K's Creations a tool to help you get your scroll frame tighter. Attach either to one rod or one to the top rod and one to the bottom rod (offset them if you use both). 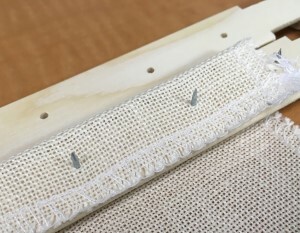 Then use the tool provided to allow you remove the slack from your fabric or canvas. It comes with an Allen wrench to lock the ring to your rod and a tightening tool to allow you to crank on the ring to move the rod. You can get the slack out of fabric or canvas with your hands, but not nearly as much as you can with this tool! This will only work on rods with a diameter of 11/16". So it will work on the K's Creations rods and Needlework System 4 rods. 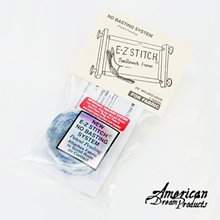 It will not work on EZ Stitch as they are too thin. You will also need to have a minimum of 1/2" clearance from the edge of the needle to the bar. It may require you cutting any twill tape attached to the rod since it needs to make contact with the wood. We have asked K's Creations to investigate a version that will work on the thinner rods so if you are interested in that, please drop us an e-mail. 1/4 in Wing Nuts (4/pk) for K's Creations or NS4 rods. Use these if you want to use a K's Creations rod on an NS4 Scroll Frame unit. You'll find the scroll frame unit for the floor stands on our Stands page. These rods and extra side bars are a special order item as we don't typically have them in the store. Add Scroll Frames to your cart! 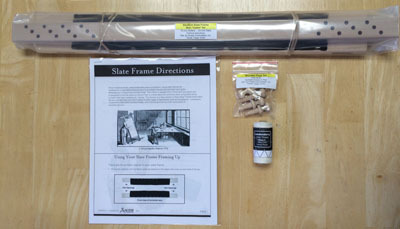 If you have never used a slate frame you might want to read on how to dress one. You'll find a great article on Mary Corbett's Needle 'n Thread blog. We are now able to get the components for the Access Commodities slate frames in several sizes so from now one we will be selling the individual components for their slate frames vs. the complete set. 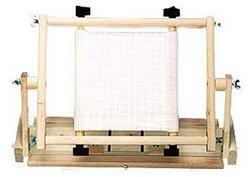 The frame includes rollers, slats and cotter pins. If you don't have lacing thread you can order it here. Add Slate Frames to your cart! Give us a call if you need a different size.